Write Results may not be a virus, but the point is, it has traits and also performs some irregularities, which may increase the risk of the entire system. Write Results refers to a potentially unwanted program created by SuperWeb LLC. This is synonymous to other adware such as RightSurf Cheapster, LeapSense, and much more. They are all used to perform specific tasks even without PC user�s consent. Some internet users often described it virus due to its intrusive and aggressive approached. Write Results serves as a platform to display various online ads. It include banner ad, pop-up ads, interstitial, and more other. Technically, displaying online ads to earn profit is its most general sense. This is precisely the reason why Write Results has been created. This is intended to perform various tasks in order to meet this objective. It tries not to disclose its real aim and entice users with plenty of useful features. But mind you that Write Results do not possess anything functional. Write Results is in fact responsible for unwanted browser redirect. Much of the ads it presented have linked to malicious web site which solely aiming for web traffic increase. Write Results only serves as a total distractions while exist on your PC. It keeps your computer and even your privacy at risk. This adware can trace your browsing habit. It record the web pages you usually visit, the products or services that you like the most, and other details related to your online activity. The worst part of it could be the dealings of Write Results to third parties. This could lead to expose your personal and bank or credit card details, and in extreme case this might be lead to identity theft. While Write Results holds or control a large portion of your machine this could be possible to harm further. Therefore, to avoid more issues from coming, you do have to remove it with urgency. - Control Panel window will open. Please proceed to the next step which is uninstalling Write Results. 4. Select adware relevant to Write Results or any suspicious items. Then, click on Uninstall button to remove it from Windows. To remove Write Results, download MalwareFox Anti-Malware. This tool is effective in getting rid of Trojans, viruses and malware. 1. When troubleshooting a PC, one common step is to boot operating system into Safe Mode with Networking. The same approach will be used in the removal of Write Results. Please execute instructions based on your Windows OS version. To make sure that no more malicious files linked to Write Results are inside the computer, we must run another effective scanner. This time, use Junkware Removal Tool. No installation is necessary with this tool. 6. After scanning the computer, JRT will open a Notepad containing scan logs. It may have not find Write Results relevant entities, but it will surely delete any malicious items not found in the previous scans. 4. At the bottom of the page, click on Reset settings to remove all changes made by Write Results. 4. In order to reverse modifications caused by Write Results, click on Reset button to bring back Internet Explorer's settings to their default condition. 3. Click on Refresh Firefox button to erase the effect of Write Results. 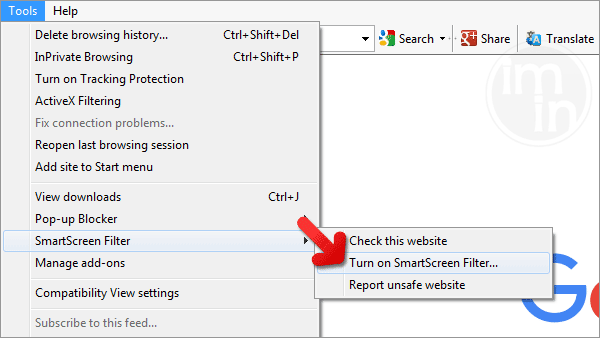 SmartScreen filter is a built-in feature in Microsoft Edge browser that can help you deter malicious programs such as Write Results. It can block malicious web sites and downloads.